While taking a breather at Gibson City Municipal before returning empty to Champaign, you have another stroke of luck. You agree to take on another stranded traveler, this one requiring a ride over to Bloomington. 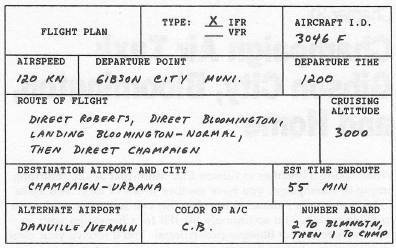 You accordingly file IFR for Champaign with an intermediate stop at Bloomington-Normal. You'll receive your clearance by phone before departure. Champaign. Roberts to Bloomington is 42 miles, and from Bloomington to Champaign is 48 miles. Clearance void if not off by twelve thirty. You taxi out and depart on Runway 36. Four Six Foxtrot squawk one zero four zero. We have an amended clearance ready to copy? 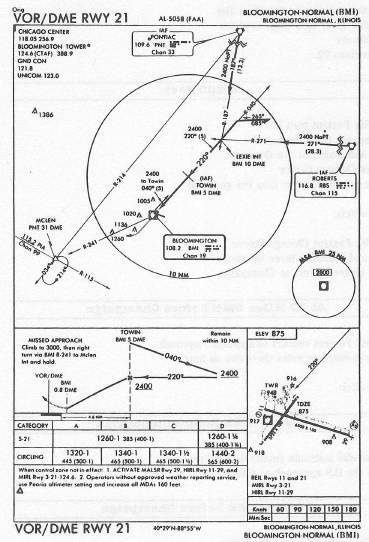 Expect the VOR/DME approach to Runway 21. On one twenty-four point six good day. Turn left onto the ramp then bear right to transient parking. You kill the engine, let your passenger off, and stroll around to look over the airplane and stretch your legs. When ready, you start up and contact Ground. Hold short before crossing Runway 29. Contact Tower on one twenty-four point six so long. On one one eight point zero five good day. You're cleared direct to Champaign. On one twenty-one point three five so long. 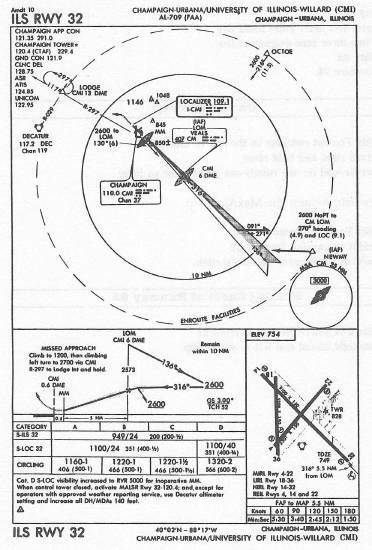 Expect the ILS approach to Runway 32. On one two zero point four see ya. Contact Ground on one twenty-one point niner so long. Switch; request the MaxAir ramp. And hold at the Runway 22 intersection. Then straight ahead and left to your ramp.